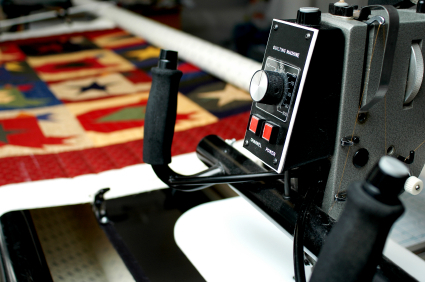 Hand-guided machine quilting for quilt tops up to 120” wide, available with a variety of repeating patterns and custom work. Patterns include roses, fluer di lis, daisies, stars, maple leaves, oak leaves, ivy vines, holly, snowflakes, cats, feathered wreaths, hearts, bears, stipple, meander, water, fish, plus “generic” patterns that can be gender neutral. All done with threads that coordinate with your top (varigated threads available). Combinations of patterns to fit the look of your top (i.e. a design that compliments the Irish chain pattern, etc.). Since the prices on the patterns vary, and cost is also determined by the size of the quilt, it’s difficult to provide pricing without knowing some specifics first. Please feel free to contact me for a free, no-obligation quote. Table runners: can be up to 20″ wide and 72″ long. Wall/hangings or table toppers: usually 24″ to 40″ wide and long. Baby quilts: can be any size from 36″ square to 45″ X 60″. 100% polyester (Hobbs Polydown): This is a low loft, extra soft batting that is very stable and light weight. Available in sizes up to 120″ wide. This can be used on any projects, quilting can be fairly widely spaced. It is very washable with no shrinkage and lofts nicely in the finished product. 80/20 (Hobbs): This batting is a very low loft, light weight batting that can be quilted either loosely or very tightly. It does have a shrinkage of 3% to 5%. This is very desirable in quilt tops that you want to appear as heirloom rather than “just quilted”. If no shrinkage is desired, the batting can be preshrunk before stitching into the quilt. This product washes well. This product is available in up to 120″ wide. 100% cotton (Hobbs): This batting just like the previously described one is a very low loft batting that can be quilted either loosely or very tightly. The most distinguishable difference is that the 100% cotton has more heft or weight. It is warm, and washes well. It does have a shrinkage of 3% to 5%. This is very desirable in quilt tops that you want to appear as heirloom rather than “just quilted”. If no shrinkage is desired, the batting can be preshrunk before stitching into the quilt. This product is available in up to 120” wide. 100% wool (Hobbs): This batting is a medium to low loft that is very stable, warm and lightweight. I have used it on several of my own quilts and find it to launder incredibly well with no noticeable shrinkage. It double batts wonderfully for those who wish to have extra warmth. Cloudloft (Hobbs): Ths 100% polyester batting is a medium loft that needs to have a close, but not necessarily tight quilting. It is warm and washable and lightweight.